Instead of draining the 2+ year old petrol, I decided to do my “Gambler Mix” (premium + every fuel additive from the dollar store with the fire/explosion symbol on it) and fired it up. After choking, stalling (so much stalling), and stumbling a bit the scooter began running normally. 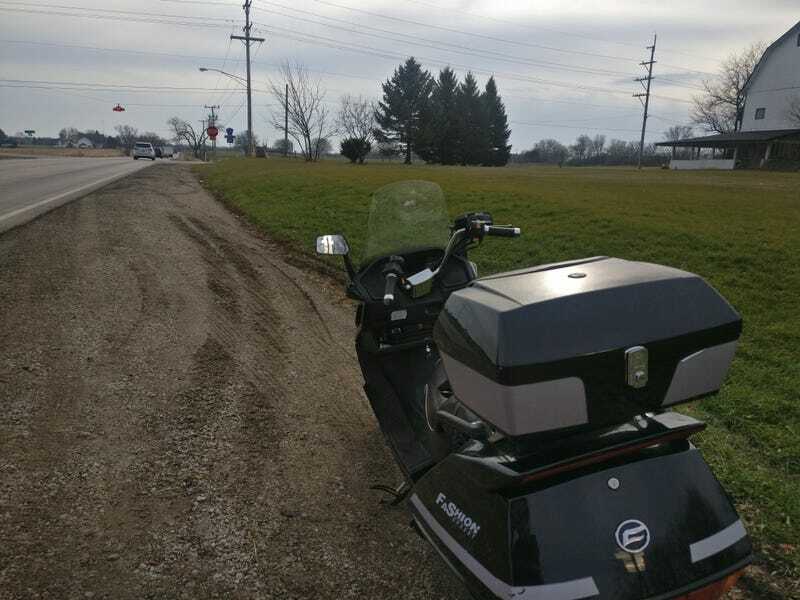 I then took it out on the backroads behind home and hit a top speed of 75 mph (speedometer indicated 80) in the high winds. After fully running the bad fuel out of the system, more tuning, and replacing the missing panels, I have no doubt I could get it to do a solid 80+. Handling is pretty amazing. The scooter manages curves so well it frightens me. The ride comfort is basically like a lightweight Goldwing as well. The cooling system is also pretty impressive. After 50 miles of WOT it didn’t even move to the halfway point in the operating range.